SSTRB Recruitment 2019 - Below are various recruitment notifications published by Sikkim State Teachers Recruitment Board. As of now, we don't have any active recruitment notification by SSTRB featured here. We may update as soon as the organization announces a new job notification. If you are looking for any information related to previously organized recruitment drives by SSTRB, you can browse through previous job notifications mentioned below and get the new updates or information you are looking for. SSTRB Recruitment 2019 - Job notification for 249 PGT Posts in SSTRB, Gangtok, Sikkim on Direct Recruitment. 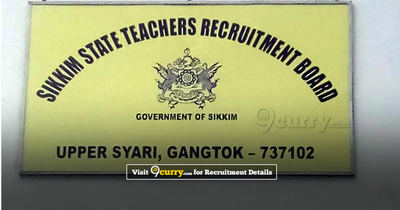 Applications are invited by Sikkim State Teachers Recruitment Board on or before 08 Mar 2019 for 249 vacancies. (a) Attested copies of Marksheets and Pass Certificate of Class X, XII, Graduation, Masters Degree issued by the recognized Board and B.Ed. degree issued by NCTE recognized institution. (c) Attested copy of Caste/Class Certificate. (d) Unmarried Certificate in case of unmarried female candidates and COI/SSC of husband’s as well as marriage certificate in case of married female candidates issued by the appropriate authority. (e) Attested copy of valid Local Employment Card. (f) Two copies of passport size photograph having imprinted name and date of birth at the bottom of the photo.